The write performance of the drive according to Anvil Utilities is only 54 MB/s, which is much lower than it should be. I tried to install the official Samsung NVMe Driver v1.1 from this page but the installer gives me the error message "Samsung NVM Express Device is not connected. Connect the device and try again." The drive is not recognized by my Windows 10 USB installation media, which is a problem because I want to eventually install Windows 10 on the SSD. 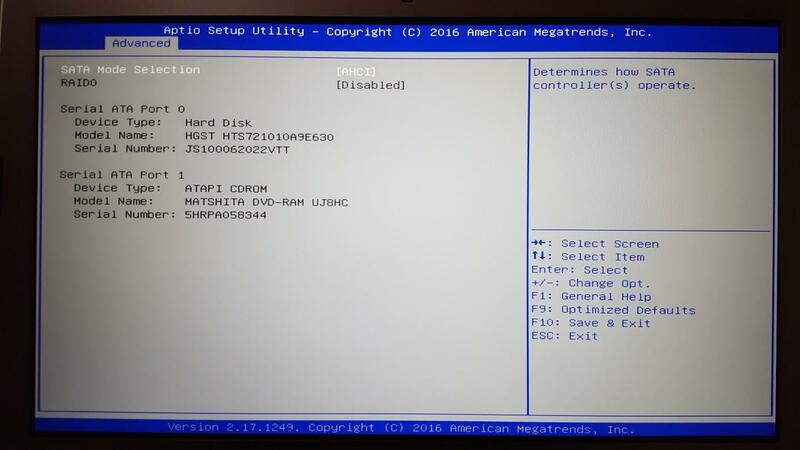 I looked around in the BIOS of this laptop, which is version 208, and tried changing various options but that did not help. 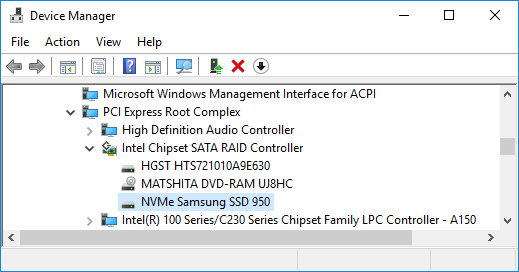 How can I make Windows recognize my SSD as an NVMe device instead of a SATA device? By pressing escape while the laptop starts up, I can access the BIOS. Here is a screenshot of the Advanced -> SATA Configuration screen. It shows the spinning platter HDD that came with the laptop and it shows the DVD drive, but it doesn't show the SSD. All of that seems good to me. There are no settings here that I can actually change. The key is that you need to disable RAID entirely in the BIOS. If your BIOS is old, it will not support disabling RAID, and you will need to update it first. Press Escape while booting to get into the BIOS setup. Use the arrow keys and the enter key to navigate to Advanced -> SATA Configuration. 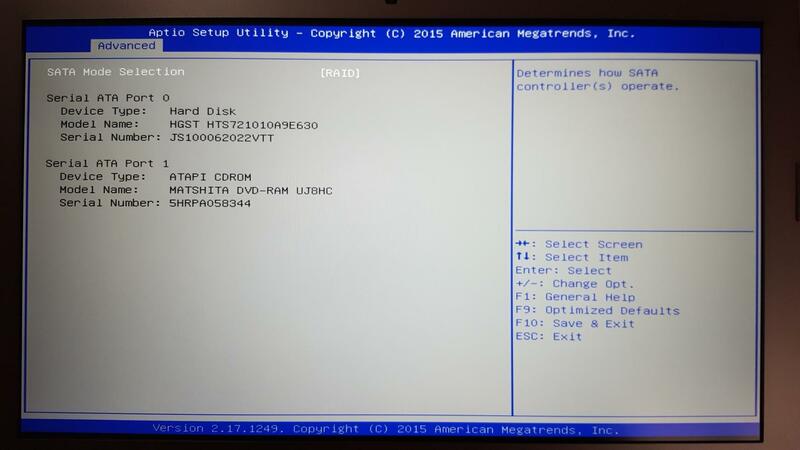 Change SATA Mode Selection from RAID to AHCI. If you have an old version of the BIOS, the only option you will see is RAID and you will need to update your BIOS as described below. You should now be able to install the Samsung NVMe Driver. After doing that and restarting the laptop, I got 2000 MB/s reads and 1400 MB/s writes on the drive. Go to http://www.asus.com/support and enter your laptop's model number in the search box to find the support page for your laptop. Go the the "Drivers and Tools" page for your laptop. There is a dropdown box to select your OS. Do NOT select Windows 10. Instead, select Others. Expand the BIOS category, and download the latest version of your BIOS. For my G752VL-DH71, the download was called "BIOS 219". Open the ZIP file you downloaded and extract the file inside it. This file is the code that runs on your BIOS. For my ASUS G752VL-DH71 laptop, the file was named G752VLAS.219. Save the file to the root directory of your hard drive or the root directory of a USB flash drive to make it easier to find the file in the next steps. Restart your computer while pressing Escape to get to the BIOS Setup. In the Advanced screen, select Start Easy Flash. Navigate through your file systems to find the BIOS file you saved in steps 5 and 6. Select the file and confirm that you want to update your BIOS. Not the answer you're looking for? Browse other questions tagged hard-drive windows-10 ssd sata pci-express or ask your own question. Internal SATA vs. PCIe-NVMe: Any compatibility? Should I install NVMe M.2 ssd in M.2 socket or in PCIe slot using PCIe adapter?